Sunday's trip to the Crossroads Village & Huckleberry Railroad included a stop at the Atlas Mill. 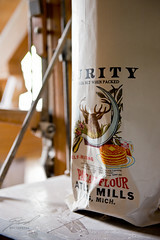 This turbine powered mill still produces whole wheat flour and corn meal (and more) available for purchase from the gift shop. This bag though is just for display. The light through the window over the turbine provided a nice look which I just had to capture.